A rock band composed by likable losers is on a mission to organise a charity concert in order to rescue their town’s Rock Park from redevelopment. Da Peng (Dong Chengpeng) is an actor, comedian, talk-show host and TV presenter, whose directorial debut “Jianbing Man” in 2015 was a fairly successful superhero parody and “City of Rock” is his anticipated second work on the director chair. 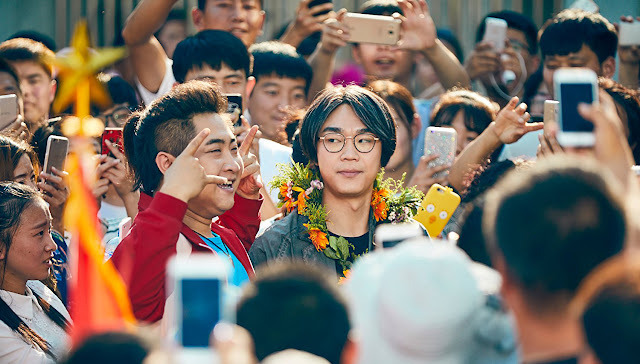 Set in the director’s real hometown of Ji’an, in the remote North-East of China, the movie script - like in “Jianbing Man” - is a joint effort between Peng and screenwriter Su Biao and has grossed RMB300 million in the first 2 weeks of its release in China. Once upon a time, the small Chinese town Jia’an was honored to have the legendary rock band Broken Guitar opening the city’s Rock Park and laying the foundation stone of a gigantic Guitar monument, hence granting Ji’an the nick name of City of Rock. Many years have passed but Hu Liang (Qiao Shan), a small boy at the time and a fan of Broken Guitar, has never forgotten his dream of creating his own rock band and more so now that the real estate developers are planning to get rid of the park and its iconic monument, in favour of profitable apartment blocks. To speed up his plan, Hu Liang contacts Cheng Gong (Da Peng), a former Broken Guitar member who now lives in Beijing and manages an unsuccessful pop group. Flattery doesn’t really work to convince Cheng Gong but a promise of a hefty cheque and few white lies do the job and the rock manager is soon on his way to Ji’an. 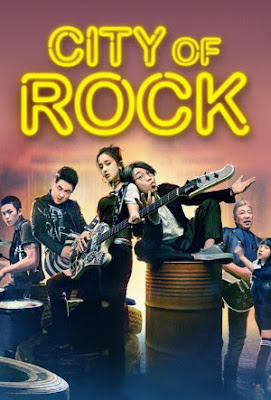 After a predictable bad start, the two open the auditions for the members of the band and end up stuck with the only four candidates available: Ding Jianguo (Guli Nazha), a female bassist with an attitude, Explosive (Li Hongqi), a Taiwanese drummer with an odd habit, Qiao Meixi (Qu Junxi), a talented and cute little girl at the keyboards and Yang Shuangshu (Han Tongsheng), an aged rock guitarist, now a respectable doctor and grandpa. They also have a “metal” name for the band, as homage to the manager’s mum and - as a fond groupie/sponsor - the owner of the “Bonjavi Supermarket". This improbable but actually rather skilled group of musicians proceeds with tricky rehearsals (some of the members must keep it a secret to their family) and few promo concerts in preparation of a big charity gig against the Rock Park redeveloping project. All seems to go according to plans but the property developers (recently the favourites baddies in Chinese movies) have money and bribing power on their side to tempt our penniless heroes. Da Peng has put together a rather predictable narrative, populated by likable, goofy characters, that is a celebration of the power of dreams and music. Such an operation could have easily gone horribly wrong but somehow “City of Rock” manages to steer away from excessive cheesiness, thanks mainly to the keen and charming cast. Da Peng and Qiao Shan (seen recently in a similar teddy-bear-like role in Wukong) provide a comedy couple with good chemistry and a balanced act, where Da Peng’s introversion tones down his partner’s excessive wackiness. Most of the film's running time is dedicated to this comedy duo but nevertheless, the other band members and also the peripheral characters are reasonably developed, at least enough to make us care about them. Luckily, the inevitable romance is just lightly touched and the also-inevitable cute little girl presence is not too sugar coated. The film suffers a bit of excessive running time (around 2 hours) and could have benefited of a sharper editing in the narrative, although the accomplished and creative editing makes some scenes, like the final concert, rather memorable and full of energy. One big bonus that unfortunately only Asian audiences will appreciate is the fact that City of Rock is literally studded with celebrities’ and real Chinese rock stars’ cameos, all revealed at the end. There is also a voice cameo from actress/model Lin Zhiling as a sweet-talking radio DJ and the lovely Zhou Dongyu has a little role as a tattoo artist (like in “A Nail Clipper Romance”). In conclusion, despite a plot line we have seen many time before and its occasional head-scratching silliness, “Rock City” is a good-hearted, upbeat, smile-inducing and honest piece of light entertainment that can sits with pride in its category.